We are deeply saddened to pass along the news that our incredible big man bunny extraordinaire has died and gone to the bunny Rainbow bridge. He was a one-of-a-kind bunny and will be greatly missed. Hello. My name is Sherwood. 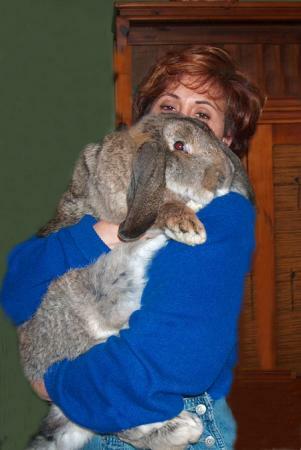 I am a BIG and muscular, French Lop boy. I arrived at SaveABunny right after the New Year in 2007. I am not available for adoption because I am one of the rabbit ambassadors and "teaching" rabbits at SaveABunny. before i was rescued by SaveABunny, I was a 4H "reject",who used to live outdoors in a hutch. When I first arrived at SaveABunny I had pneumonia and wasn't used to being handled, but boy have have I come a long way! I am such a large, GORGEOUS rabbit that people are just naturally drawn to me and I am a little shy and not used to being made such a fuss over. But, deep down, I really like it! There is just something so special about the really big bunnies like me. I am bigger than the cats who also live her at SaveABunny and you haven't really lived until you see me galloping around like a tiny little horse! Thanks for reading about me and I hope to meet you soon!